BJJ Legends interview, we get an inside look at Lachlan Giles and his journey which has led him to the ADCC. A tournament that comes around every two years, the ADCC Championship is considered the Olympics in submission grappling competition. Established in 1998 this event features a collection of elite grapplers from across the globe. Emitting live from Sao Paulo, Brazil the 2015 edition of ADCC will feature a diverse pool of seasoned veterans, rising stars, and unknown talents all competing to be recognized as the best. For some participants it’s just another day battling to claim a prize. Yet for some entrants being a part of this event has a deeper in fulfilling a lifelong dream just to compete. Thirteen years of blood, sweat, and tears have finally culminated for Australia’s own Lachlan Giles. Winner of ADCC’s Asian Trials, this will be Giles ADCC debut as he looks to not only to fulfill his dream but also showcase the talent of the submission fighters from down under. Talk to us a little bit about your journey and how you got started? Lachlan Giles: I initially started martial arts when I was 14 years old; I watched a kung fu movie and thought it would be cool to learn kung fu. At some point my instructor showed me a VHS of UFC 1. I watched Royce Gracie dismantle everyone, including a kung fu expert, but I refused to believe BJJ was better. After about 6 months of denying that BJJ was better than kung fu, I finally gave in and decided to try a class. I think I was almost 16 years old at that time, after that I was hooked! 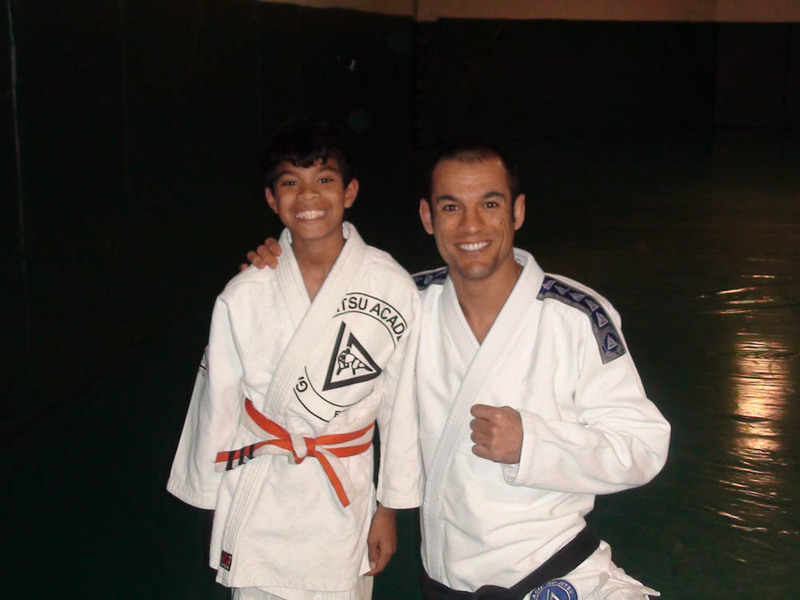 I have had a large array of coaches and influences throughout my BJJ career. Until purple belt I was under Tyrone Crosse, he left the gym I was training at so I then had George Sotiropoulous as a coach for a brief period. George left to pursue his MMA career and John Simon came in to replace George. I received my black belt from John Simon/John Will in 2012. However John was unable to train due to injury since I received my brown belt, so I had a heap of help from some of the best grapplers in Melbourne (Dave Marinakis, Lee Ting, Cam Rowe, Dave Hart, Kit Dale, Michael Hourigan, Jamie Murray, Ninos). It was a great experience to receive my black belt in the presence of all these people who had a profound impact on my BJJ. Becoming a black belt what are some of the challenges you face at this rank and most importantly what keeps you motivated? Lachlan Giles: The most challenging aspect of being a black belt in Australia is the difficulty in competing at an international standard. We have a lot of talented grapplers in Australia but it is rare to see them all on the same mat. Therefore the environment is different to that you would see at the headquarters for some of the bigger teams in the world. That said we are developing a great competition team at Absolute South Yarra and there are a bunch of people training full time. Two of our female athletes took silver medals at the worlds this year (Livia Gluchowska-purple, and Nikki Lg- White). Keep an eye out for guys such as Ben Hodgkinson who are sure to make some waves in the next few years. These guys push me every day! My main motivation for training is that I enjoy it. I think people get bored of BJJ when they stop trying to learn. There is always something new to work on, and that’s why I want to keep training until I am 70. What does being a competitor mean to you? Lachlan Giles: Competing is always a good reality check and it keeps me motivated. It is a way of testing myself to see how well I can implement my game. I think it’s easy to not compete, especially as a black belt and a coach where there is a fear of having my students see me fail. The funny thing is that it’s my failures that have given me the most of my success. I think as a blue, purple and brown belt I probably lost as many matches as I won. Even at black belt I wouldn’t say I am too far off. However, every time I lose I am back at the gym the next day, my motivation skyrockets. The reality is that your students/training partners don’t actually care when you lose. Sometimes I think you can do much more as a role model for your students by losing and fixing your mistakes, than you can by winning a match. 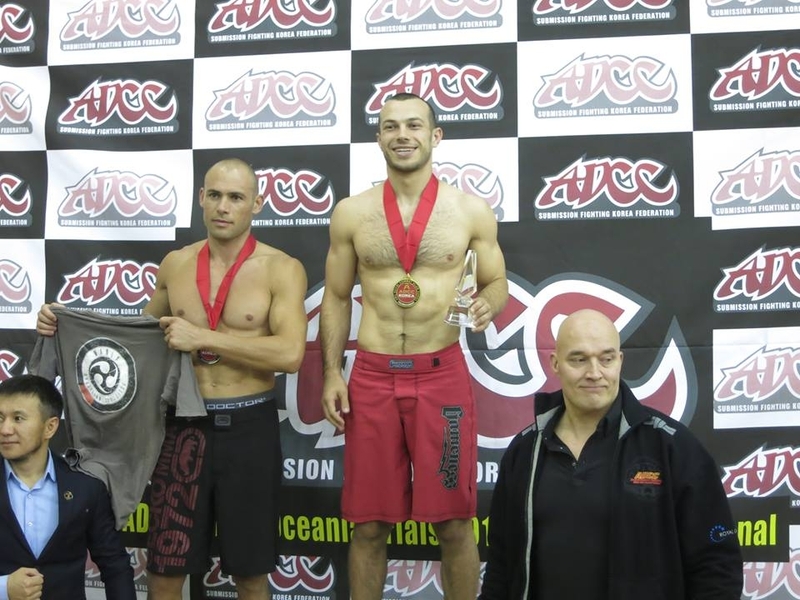 You recently achieved a major accomplishment by winning the ADCC Trials. From the traveling to another country to compete, advancing in the rounds, and winning the event. Talk to us about that memorable day? Lachlan Giles: Winning the ADCC trials was always a dream of mine. 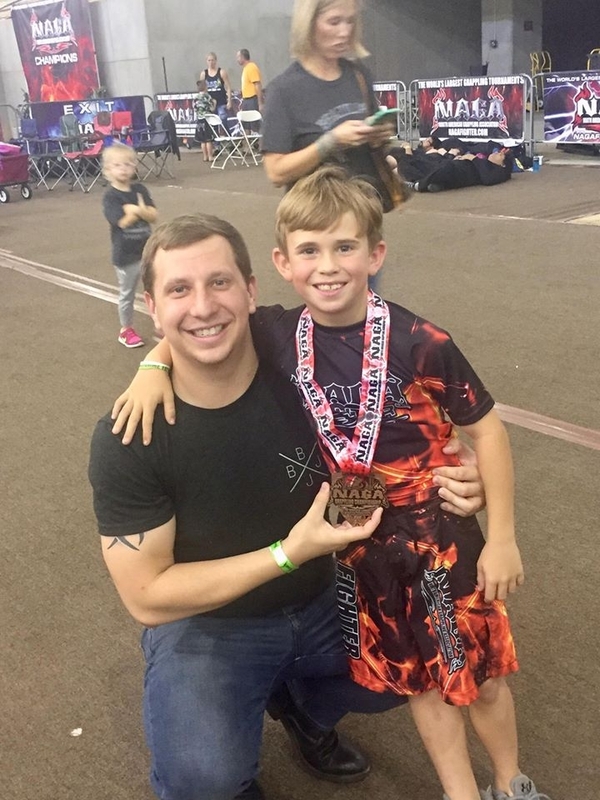 I had 3 goals in BJJ, receive my BJJ black belt, open up a gym, and compete in ADCC. The event itself was a bit of a surreal experience. The tournament was held in a large hall. This was in the middle of the Korean winter, which was below freezing temperature. They turned the heater on after everyone arrived and it wasn’t until about 12pm that the venue was warm. I competed around 10 am so I was warming up with all my clothes on! There was a large mix of people from different nationalities. The majority of competitors were from Korea, although there was a reasonably large Kazakhstani and Australian contingent. I won my first 2 matches by submission, which advanced me to the semifinal. I was told by an Irish-man living in Korea that the guy I was fighting in the Semifinal was the favorite. I managed to get an early heel hook in that match, which advanced me to the final. In the final I was facing Benjamin Aldridge, from New Zealand (now lives in Australia). Ben’s aim was to run down the clock and force overtime, where he would implement his wrestling more effectively. I had a few submission attempts from guard but none of them stuck. With about 10 seconds to go the score was even and I managed to lock up a triangle. I knew there was very little chance of finishing the choke in that time so I switched to an omoplata and sat up for the sweep. I came on top with about 2-3 seconds to go, and then the buzzer went. There was a long pause as the judges were discussing, and then I was awarded the 2 points, and the victory! Australians won 3 out of the 5 divisions that day. We celebrated that night with some Korean BBQ and Soju. Your division in ADCC features stacked pool of talent Kron Gracie, Garry Tonnon just to name a few. How do you feel going up against them and what do you feel your chances are coming out with the victory? Lachlan Giles: There are definitely a lot of big names in the division, which is very exciting for me. I have trained with people the same caliber as the people in my division (and even some of the people) so I know what to expect. I am not going into the event as the favorite but I think it’s possible to beat anyone, particularly in no gi where the pace is very high and a single mistake can cost the match. Throughout my BJJ career I have fought the likes of JT Torres, Murilo Santana and Roberto Satoshi so it won’t be a huge shock to go up against a big name. However I think the crowd in Brazil will bring the event to another level! Talk to us about your training for this event? Lachlan Giles: The majority of my training is done at my gym Absolute MMA. We have a great amount of high level guys. I am training a lot of wrestling as I think this is a very key aspect to ADCC that is often under looked by the competitors. We have some great wrestling coaches in Australia and I am trying to get as much out of them as I can! Closer to the event I think we will be getting all the Australian ADCC competitors training together on the same mat, which is going to lift the level considerably. I am continuing to try to evolve my game at this point and I will start trying to do some really intense rounds as of about 4 weeks out from the competition. Finally what would winning ADCC mean to you? Lachlan Giles: I honestly think I train just as hard as everyone else in the division so it would be great to see that hard work pay off. I am trying to think of an example where a male Australian has beaten a really high level black belt and nothing comes to mind at this moment. To win the event would be incredible but you have to take it one match at a time. A victory against a big name would be a huge thing for BJJ in Australia. Any finals thoughts or people you would like to thank thanks?